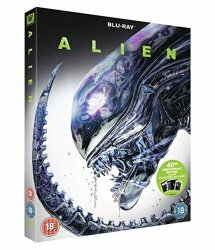 A sealed copy of Alien 40th year Anniversary. To Enter please just Reply to the thread with an Alien themed Gif . 2 nd like my Zavvi collection That's all you need to do. Postage Worldwide will be covered by me. @Robles Thanks for the giveaway. Don’t count me in. Just a quick fyi, don’t rely on the “thanks” to get your list of giveaway participants as that list will show you the latest 51 names only, but if you have 100 people that are participating, you won’t see their names in that list. You’ll just see you have 100 thanks without being able to see a complete list. Best if you get people to post. Many thanks for the giveaway @Robles. Very generous of you! Thanks for the giveaway !!!! Last few hours of this being open, will be choosing a WINNER around 10pm.